What is it with skilled engine programmers and their ability to turn thousands of cubes into an impressive beauty? Though not entirely voxel-based like, say, the Atomontage Engine , the VoxelFarm Engine from creator Miguel Cepero still does a perfectly fine job rendering amazing landscapes on the fly. VoxelFarm harnesses ambient occlusion and a special block coloration system for a subtle and natural appearance. Removing chunks of blocks leaves softened edges affected by light and shadow instead of harsh angles. The procedural generation of the terrain means distant mountains and other landmarks take on a wonderfully smooth color gradation. It almost makes me not want to think about the possibilities of plundering such an exquisite environment in a Minecraft-like sandbox game. 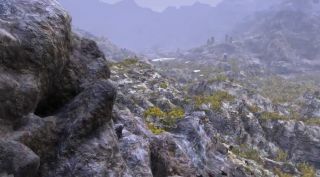 Though VoxelFarm is little more than an ambitious tech demo for now, Cepero's website offers an abundance on the intricacies of procedural graphics, voxels, and polygons. It's definitely work checking out.